It’s hard to slow down and notice things in a busy world. Try to take the time to experience your environment with all of your senses — touch, sound, sight, smell and taste. For example, when you eat a favourite food, take the time to smell, taste and truly enjoy it. Simple mindfulness exercises can be practised anywhere and any time. Research indicates that engaging your senses outdoors is especially beneficial. Why not use your commute as your quiet time? Guided meditation on apps like Calm, or finding a piece of instrumental classical, jazz, world or new age music and taking deep breaths can help turn your commute into a meditative experience. As August arrives, the summer commute into work becomes a sweaty endeavour marked by crowded bodies, the stench of city garbage and exacerbated FOMO (“fear of missing out”) from missing another perfect beach day. Wellness experts think such a thing is possible, part of a movement that prizes self-awareness and making small, conscious steps toward a healthier, fulfilling life — like adjusting your morning commute routine. Manisco suggests a balance of protein and carbohydrates to keep you full and energized until lunch. Her favourite breakfast? “A protein shake made from organic soy milk, raw, unsalted walnuts (they’re high in nutrient-dense omega-3 fatty acids), a variety of seeds, oat bran and either a stalk of celery or a handful of spinach,” Manisco says. For sweetness, she recommends adding natural cocoa or a date. If you skip the protein shake, Manisco recommends wholegrain toast, a handful of nuts or seeds, and a cup of fruit. She warns against coffee. “Caffeine will get your heart and adrenals pumping artificially, and thus could have you feeling unnecessarily anxious or depressed,” Manisco says. Kart takes Metra to work each morning and notices the same behaviour causing neck pain among commuters: “text neck.” “Text neck” occurs when you lean your head over your phone, straining your neck muscles and thus causing joint pain. To alleviate this, Kart recommends a simple fix: “If you’re standing on the ’L’ or Metra, the movement of the train helps you practice stability and balance and work your postural muscles,” he says. Annoyed by the loud chatter or the loudspeaker on the train? “Incorporate those sounds and how they make you feel into your meditation,” Jones says. He recommends the guided meditation on apps like Calm, or finding a piece of instrumental classical, jazz, world or new age music and taking deep breaths while asking yourself questions such as: “Who do I want to be, regardless of what does or doesn’t happen today? Do I want to be a jerk, or a kind soul? Do I want to embody possibility, or show up exuding impossibility? Barbara Smith and Mary Linda Burgess want you to take care of yourself. Smith, a psychotherapist, and Burgess, a social worker, aren’t talking about treating yourself to an afternoon latte or getting a pedicure (though they both agree that there’s nothing wrong with a little self-pampering). For Smith and Burgess, this type of self-care goes much deeper. “This isn’t ‘Go out and do something.’ This is, ‘Come in.’ Be with yourself. Ask yourself what you need,” said Burgess. 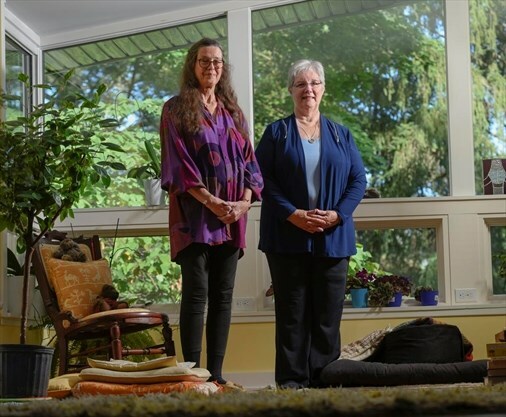 Smith and Burgess are the founders of Mindful Self-Compassion Hamilton, an eight-week program that uses mindfulness — the practice of focusing one’s awareness on the present moment — as a tool for practising self-compassion. Their course, which runs for eight, three-hour sessions, is a blend of meditation, short talks, experiential exercises, group discussion, and “homework” — exercises for participants to practice at home. The class focuses on developing the three key components of self-compassion: self-kindness, a sense of common humanity, and mindfulness. Our internal critic, say Smith and Burgess, leads us to self-judgment, isolation, and either overidentification or avoidance of negative emotions. The benefits are many, say Smith and Burgess. They point out that there are over 1,400 articles on self-compassion in the psychological literature, and that research shows that self-compassion is strongly associated with fewer negative states like depression, anxiety, stress, shame, and negative body image. At the same time, it’s strongly linked to more positive states like happiness, life satisfaction and optimism. Smith and Burgess — who met when they were both working on the Hamilton Family Health Team — run roughly three courses every year, each of which is different depending on the makeup of the class. The people who attend are from all walks of life: different age ranges, different professions, and different backgrounds. The course isn’t meant to be a substitute for therapy, though it can help to support those who are in counselling. The course follows a curriculum written by Kristin Neff, an associate professor in the University of Texas at Austin’s department of educational psychology, and Chris Germer, a clinical psychologist and lecturer at Harvard Medical School. Both Smith and Burgess have gone through training in order to be certified to teach the course. Those who have taken the course say self-compassion has helped them to feel more grounded, calmer, and more able to cope with difficult situations. “It meets a need for folks that traditional programs — for example, self-esteem programs — doesn’t address. Self-compassion is what the world is lacking. It meets that need on a deeper level,” said Burgess. What is the role of mindfulness in the modern age? Going for a walk anywhere these days is a practice in dodging distracted people. Headsets in and eyes lowered, people are walking about without paying any attention to what is going on around them. It is amusing to watch two techno-zombies bump into each other, upset with being interrupted from their screen. I have seen two people with their heads down trying to avoid each other, fail by bumping into each other, and, still with their eyes glued to their devices, both try to go the same direction and collide again. The distraction doesn’t just affect in a harmless, comical way either. Where I live in Ontario, the provincial police reported in 2016 that three of the previous four years set records for the number of pedestrian fatalities. It is possible that a combination of distracted drivers and distracted pedestrians have led to this increase. My grandmother used to call the television the “idiot box,” but I think we may have a new contender for that moniker. People are so focused on the tiny screen in front of them that they do not take the time to look around, pay attention to their surroundings or enjoy the moment they are in. Mindfulness is the practice of focusing your attention on the present moment, where you are and what you are doing. It is a chance to look at the people, the scenery, the world around you. When you are with friends, be with them. Not paying attention to the world around you has consequences. Not only for you but for others as well. In Toronto, my friend watched as a mother, with her face immersed in her device, rushed off the subway train and left her toddler behind. Whatever was on the phone was more important than her child. My friend saw what happened and got off at the next stop with the little guy and brought him to the subway agent. The agent told him this is not the first time she had seen this happen! All the electronic devices in our lives allow us to respond from anywhere at any time, yet we use them to respond all the time. Far from making things more convenient, they have taken away the easy aspects and replaced them with stress. When will we learn that multitasking really isn’t – multitasking really means doing several things poorly instead of one thing really well. Many mistakenly believe they can multitask effectively, but study after study has shown that the human brain is simply not able to juggle so many balls at once. I’ve been in far too many meetings where one or several people are typing away on their computer or fiddling on their device and they grind the meeting to a halt when asked a question. And how often do you hear, “I need to respond to this right now”; “What did he post today?” or “Just let me read this one thing.” The device seems to demand your time at this instant. But does it really need to be answered right away? This need for instant gratification and connection has even manifested into a psychological phenomenon. “Phantom vibration syndrome” has been much studied by researchers with data published in medical journals such as the BMJ. Phantom vibration syndrome is the feeling that your device is vibrating in your pocket even when it isn’t there. But once you learn to leave the device alone or only check it at certain times, you will naturally be more present and relaxed. The best part of mindfulness practice is the peace of mind it brings. Over the past several months, I have stopped checking my phone all the time. I have put the electronics away and spent time with people. I have become more in the moment. It can’t be coincidental that my stress level has decreased and my happiness has increased. When I first started my mindful practice, I thought it was going to be some jive hippie stuff or some pseudo-religious ceremony, but it really wasn’t either of those things. Taking some time each day to be in the moment was actually more freeing than I had expected. We all have busy lives juggling work, family, friends, health, hobbies and a myriad of other tasks. So how can you find time to be mindful? Put the phone down. Focus on your breath for five to 10 minutes just as you wake up or go to sleep. Simply be part of the world around you. You don’t have to stop and smell the roses, but you can at least notice that they are there. Lee Elliott lives in Bolton, Ont.